Suzy Handgraaf from Worthing Court was able to make every welcome a warm one thanks to free fresh-cut tree delivery. Read the blog to see how this entryway look came together with the help of her daughter and granddaughter. Nothing smells more like Christmas than the scent of a live Christmas tree. When my daughter was selecting Christmas decorations for her new home, she knew right away that the smell of a live tree in her foyer would welcome her guests in a most festive way. With her very busy schedule, she was pleased to find out that The Home Depot now offers fresh-cut tree delivery for free! 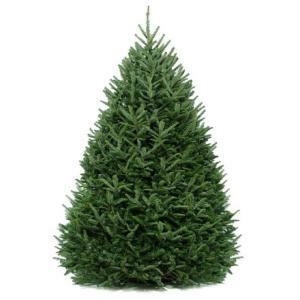 Of the three sizes available, she chose the 6′-6.5′ freshly cut Fraser Fir tree. The tree that arrived smells divine and is lush, full and perfectly shaped! My granddaughter and I didn’t waste any time getting started with creating fun memories by adding lights and getting the tree ready to decorate. 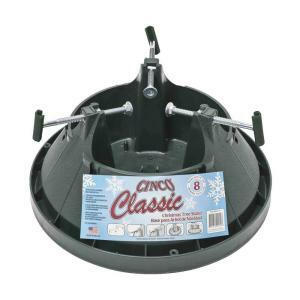 To make sure that the tree was well supported, we used the Cinco plastic express Christmas tree stand, which has a generous water reservoir and is meant for trees up to 8′ tall. For an updated look, we opted to use this burlap tree stand collar instead of a traditional tree skirt. 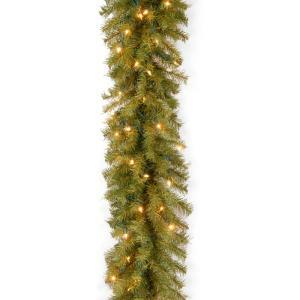 It simply wraps around the tree stand and attaches in the back with loop fasteners. We fell in love with the colorful 4″ wide striped ribbon that is a part of the Snowtop Dazzle Collection. It really dressed up the pre-lit 9 ft. Norwood Fir artificial garland that we used on the banister and it became the inspiration for all of the ornaments that the tree is decorated with. 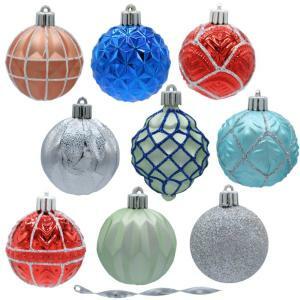 After cutting the ribbon into 24″ strips and tucking it into various places around the tree, we used three boxes of shatter-resistant ornaments from the Snowtop Dazzle Collection. 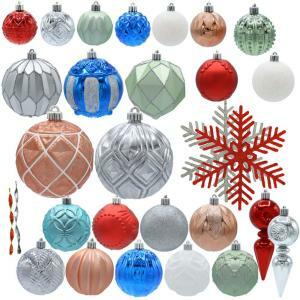 Two boxes of the assorted ornament set, that is filled with a variety of ornaments of different shapes and sizes, along one container of the 101-count assorted ornament set. With the tree decorated, we filled in around the bottom with a few of my daughter’s favorite childhood decorations. My daughter and her family couldn’t be more pleased with the end result! One of my favorite tricks is to tie the Christmas decor on the front porch to the decorations in the foyer by using some of the same elements in both places. That will give your guests a glimpse of what they can expect to be greeted with as they enter your home. We started by adding two 4′ Dunhill Fir entrance trees with clear lights to each side of the front door. We made a bow for the wreath with the same gorgeous ribbon that was used on the banister and the tree in the foyer and filled two lanterns with leftovers from the assorted ornament set. It’s not too late to make holiday magic happen in your home. 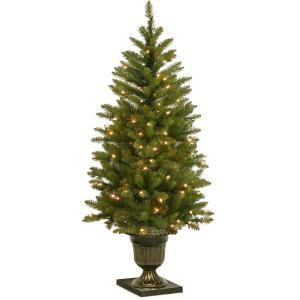 See the selection of fresh holiday greenery available for free delivery from The Home Depot here. I hope you’ll find these ideas inspirational while decorating this holiday season! You can discover more ideas on how to decorate your home for the holidays on The Home Depot Blog here.